Here comes the major step of creating email triggers for each segment user belongs to. Go to Triggered from the left panel and start by naming your campaign. Ensure that you keep your campaign names easy to be understood by the team for better management at a later stage. You can either set up a Segment driven campaign (where the email will be sent to user who will enter a specific segment) or a event driven campaign (where email is sent on the basis of user action). 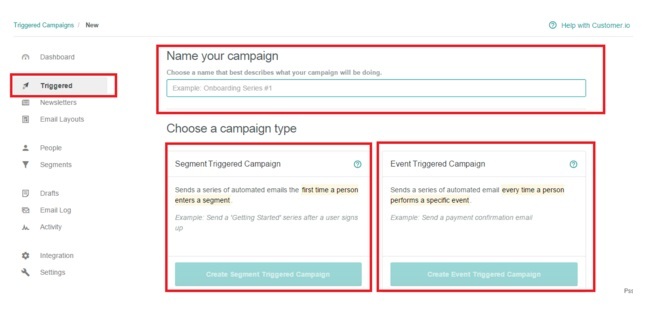 Since you are following campaigns based on email tracking you must select segment triggered campaigns. Based on the segment you want to send the email, you can create the segment filter. Start with the setting up the email workflow. Subject: Depending upon your objective, set your subject line. For a promotional email, using a creative and non traditional subject line will work. Whereas, for an educational / training email a more clear and simple subject line works. Email body: Keep the email body crisp and yet descriptive enough that it clearly states out what you want to communicate to the user. You need to ensure that your emails motivates the users to perform the action desired by you. You can modify the the email deliverability by making the changes from the workflow. Communication too frequently and not communicating at right time will affect the actions. Suggested time gap for email should be a minimum of 5 days and max the cycle gap should go upto 45 days for products with longer sales cycle. It’s recommended to set initial set of emails on the base of your user understanding and depending upon campaign performance you can tweak the campaigns at a later stage. Also, you can add multiple emails to the same campaign by clicking on the “Add Button”. If you want to analyse the campaign and understand its effectiveness. You can work up on setting up of Goals on moving forward. On moving forward, all you need to do is “Review” and “Start Campaign’. Your campaign is live!